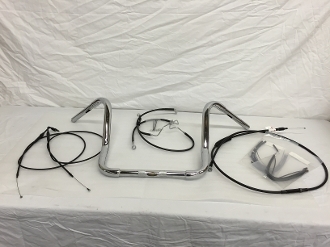 Extra wide bottom and special bends are necessary for proper fitting ape hangers on Electra glide models. WORKS WITH THROTTLE BY WIRE! Includes complete cable kit for your 1996-2007 FLHX, FLHT/C/U (Harley touring with batwing fairings) AND HD TRIKES.